We were meandering down the streets of the town where I live, enjoying a leisurely Sunday afternoon. He had surprised me by driving up to take me to breakfast. I was floating, savoring the pleasures of the moment: the beautiful cool spring day, a tasty breakfast of pancakes and bacon, and most of all, being with my Master in person. He is subtly different in person. He looks very much like his avatar. But his avatar never smiles. The flesh and blood man smiles constantly. Always smiling. He exudes warmth and charisma and charm. In person there is a difference in the timbre of his voice. Richer. Softer. I hear confidence and strength, but surprising tenderness. His voice wraps around me like a down comforter, and makes affection and adoration pour out of my heart. We passed a new Italian gourmet market. With a twinkle in his eye, he asked if we should pop inside to have a look. I smiled and nodded eagerly. We perused the culinary delights: trays of salads, entrees and artisanal pizza. The salumeria tempted us with fresh pasta, prosciutto and cheeses. 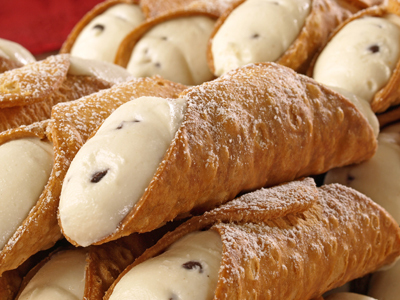 We oo’d and ah’d over the pastries: creamy cannoli, tiramisu, butter cookies piled high. He said he was going to get himself a sandwich for later. I wandered through aisles of imported olive oil. A few minutes later we left to head home. As we came out of the market, he pressed a bag into my hand. “Here,” he said simply. Curious, I peered inside. The bag contained dinner for me for that night—chicken francese and polenta—and a huge box of the cannoli I’d been admiring. My little gasp of delight at the unexpected treat made his face light up with pleasure. This simple expression of generosity will come as no surprise to anyone who knows him. I have never met a more generous person, or one who takes more delight in it. He absolutely loves to cause that response of surprise and pleasure with his gifts. And because he does so much for me, he gets to see that reaction often. I hope he knows that I love his gifts—but his gifts are not why I love him. My love grows from the honor of knowing him and having him in my life, being loved by him, and the remarkably wonderful person he is. He is the most delightful gift of all. Oh, that is so sweet! What a beautiful post, Camryn.